The Coathangers have released a single “Nosebleed Weekend” from their upcoming LP, Nosebleed Weekend. The song is the fifth track from the new album. The band also announced their upcoming tour dates for the new album that will start in March of this year. 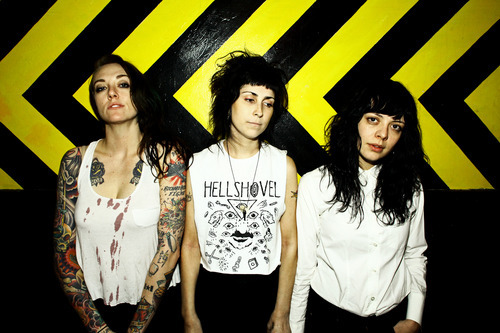 The Coathangers single is a reflection piece of the southern sounding band. The single is the mark of the band’s tenth anniversary. The song flows with the rest of the album in which their single “Perfume,” which sounds like a tribute to the Wilson sisters from the band Heart. The sound of sultry vocals with smooth guitars can make even Stevie Nicks proud to hear its perfect rhythm. “Nosebleed Weekend” is anything unlike its lingering beginning, its the full on bar brawl, the moment where after listening to the car radio with the hood popped down, the door opens up to a bar fight. It’s southern, rocky, and boisterous like sitting down onto a bar stool and asking for a shot of Whiskey and putting a quarter into the old Jukebox by the door to play some good old fashioned Texas music. “Nosebleed Weekend” doesn’t sound like Coathangers much, but it’s a hell of a journey to head back to their roots. The new album was recorded outside their comfort zone, in a record label located in the North Hollywood portion of California. It was the perfect album to make a perfect time capsule of the seventies, the edge that Coathangers often reflect in their own music. “Nosebleed Weekend” the single is the true notion of sticking to your guns.